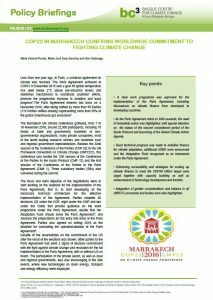 – A clear work programme was approved for the implementation of the Paris Agreement, including discussions on climate finance from developed to developing countries. 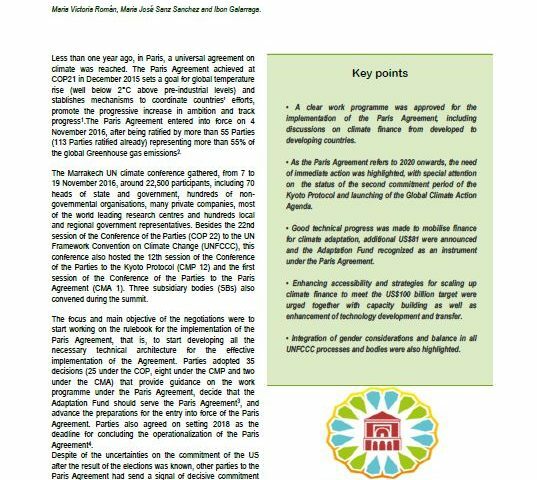 – As the Paris Agreement refers to 2020 onwards, the need of immediate action was highlighted, with special attention on the status of the second commitment period of the Kyoto Protocol and launching of the Global Climate Action Agenda. – Good technical progress was made to mobilise finance for climate adaptation, additional US$81 were announced and the Adaptation Fund recognized as an instrument under the Paris Agreement. – Enhancing accessibility and strategies for scaling up climate finance to meet the US$100 billion target were urged together with capacity building as well as enhancement of technology development and transfer. – Integration of gender considerations and balance in all UNFCCC processes and bodies were also highlighted.